In the first part of this series, professor Michael Schwartz, author of a recent new book on the Iraq war, examines the twists and turns of the Bush administrations' rush to have a security pact approved by the Iraqi Parliament before Bush leaves office. 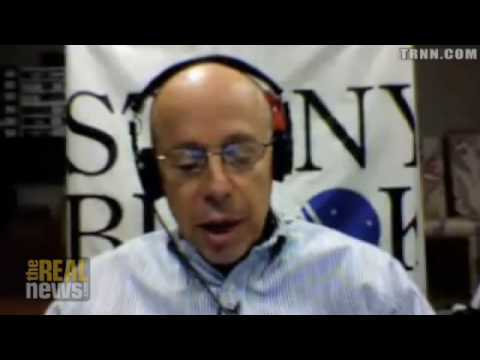 PEPE ESCOBAR, ANALYST, TRNN: Michael Schwartz is professor of sociology at Stoney Brook University. He wrote one of the best books about the Iraq War, in fact putting the Iraq War into context. It’s called War Without End: The Iraq War in Context. Michael, welcome to The Real News. MICHAEL SCHWARTZ, PROF. SOCIOLOGY, STONY BROOK UNIVERSITY: Thank you. Thank you. I’m glad to be here. ESCOBAR: Michael, let’s start with the—I wouldn’t say the smaller picture, because everything concerning Iraq is big. It’s larger than life. But let’s stop talking about the SOFA. How do you read the fact that this SOFA, the Bush administration has pressed for its approval before Bush leaves office, in the transitional period between the Bush administration, the Obama presidency, right before the parliamentary recess in Iraq, with a text that virtually nobody read in Iraq and very few people in the United States have read until the last two days or so, subject to amendments and with lots of loopholes? What does that tell you about the continuation of the American imperial enterprise in Iraq? SCHWARTZ: Well, I think the question gives away the answer. It’s clear that Bush is trying to create some legacy or permanence to his enterprise that he simply bequeaths to the Obama administration. But I also think there’s a number of other pieces of urgency that have created this pressure. Let’s keep in mind that the negotiations for this agreement have been going on for the better part of a year now and that the original demands that the United States made for the SOFA were far more far-reaching and expansive than what we see now. And I think that it’s the original demands that give us a sense of what the Bush administration’s ambitions were and what they remain, though they’ve had to give a lot of ground in order to get the Status of Forces Agreement signed. In the original agreement, what I think is really significant to look at is, first of all, that the American presence would be indefinite—there would be no time line on it; secondly, that the United States would control the airspace over Iraq for the foreseeable future; thirdly, that any American operations within Iraq would be undertaken under the strict US command without any vetting or veto power for the Iraqi government; and, finally, that the United States would be free to use Iraqi territory and the bases the United States establishes there for attacks against neighboring countries if the United States felt it was necessary; and, finally, that the United States would have the right to an incredible number of permanent bases on Iraqi soil. That was the original set of demands. Now most of those demands have been compromised in the subsequent negotiations, but always with the United States or the Bush administration giving ground begrudgingly; and therefore I think we get a sense of what the ambition is. And if we look at the final agreement, and especially given the kinds of loopholes that exist in the agreement, I think we can see that there’s still room for all those ambitions to be fulfilled. So if the Maliki government remains compliant with American wishes, they have actually managed to sign an agreement that will allow them to have all of these elements of the agreement restored, even though they aren’t on paper in this new one. ESCOBAR: Right. Some, I would say a sector, of the Iranian leadership, or at least a sector of the Iran-controlled media, has been spinning that this is a victory for the al-Maliki government against the neocon plan for Iraq. On the other hand, people are saying that Maliki has been talking to the leadership in Iran all the time, of course, because Dawa is very close to Tehran. And so he got the imprimatur of Tehran for this latest version of the agreement. SCHWARTZ: Well, I think maybe the Iranians might view it as somewhat more of a victory. This does give the Maliki government the right to say to the United States, "You have to leave at the end of 2011," and it gives them the right to say, "You have to withdraw into your bases outside the cities by the middle of next year," and it gives them the right to say that "You can’t conduct certain operations, military operations, within this country without our approval." So in a sense it is giving the Maliki government a tremendous amount of leverage over the US, at least on paper. So I think, from the Iranian point of view, if they feel that the Maliki government is a reliable ally of theirs, they have a reliable ally that actually can exercise some real constraint over the American military and, therefore, over the American occupation as a whole—. So I think, from their point of view, they can look upon this as a pretty tremendous victory. And I do think that even if the United States has no intention of honoring any of the details of this—and of course the US has 150,000 troops in Iraq who can decide not to honor any of it kind of at any time—there’s certainly nothing to stop them from refusing to honor it. The fact that this agreement has been published to the world, and the process by which the United States made all these very expansive demands and then signed an agreement which had much less expansive demands, is itself a statement to the world that the United States was really negotiating not from such a position of strength and ended up having to give a tremendous amount of ground. And if they were to then break the agreement, I think that the world would see this as another act of desperation by the US government. So the US government has lost, I think, a lot in signing this agreement. And even though there is this escape clause—and I think we all kind of sense that they’re looking to use the escape clause—I still think that the full impact of these compromises is going to, you know, reverberate through the political system in Iraq, the political conditions in Iraq, and also the political posture of the United States in the world. So I think we’re looking forward to some real changes in the way the US is going to be able to operate.